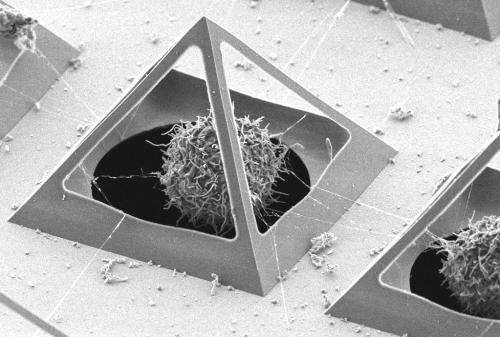 Chondrocyte captured inside a micro pyramid, interacting with its neighbours. A field full of pyramids, but on a micro scale. Each of the pyramids hides a living cell. 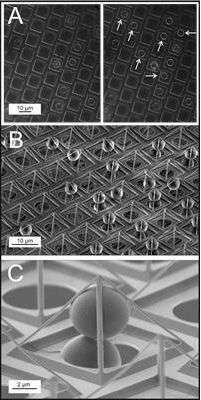 Thanks to 3D micro- and nano scale fabrication, promising new applications can be found. One of them is applying the micro pyramids for cell research: thanks to the open 'walls' of the pyramids, the cells interact. Scientists of the research institutes MESA+ and MIRA of the University of Twente in The Netherlands present this new technology and first applications in Small journal of the beginning of December. Most of the cell studies take place in 2D: this is not a natural situation, because cells organize themselves in another way than in the human body. If you give the cells room to move in three dimensions, the natural situation is approached in a better way while capturing them in an array. This is possible in the 'open pyramids' fabricated in the NanoLab of the MESA+ Institute for Nanotechnology of the University of Twente. Cells moving into the pyramids. The cleanroom technology applied for this, has been discovered by coincidence and is now called 'corner lithography'. If you join a number of flat silicon surface in a sharp corner, it is possible to deposit another material on them. After having removed the material, however, a small amount of material remains in the corner. This tiny tip can be used for an Atomic Force Microscope, or, in this case, for forming a micro pyramid. Tiny balls captured by the micro pyramids. In cooperation with UT's MIRA Institute for Biomedical Technology and Technical Medicine, the nanoscientists have explored the possibilities of applying the pyramids as 'cages' for cells. First experiments with polystyrene balls worked out well. The next experiments involved capturing chondrocytes, cells forming cartilage. 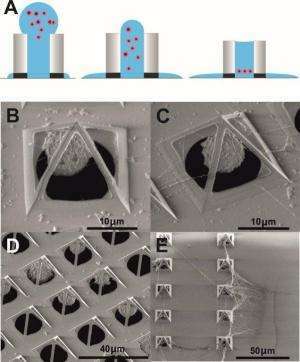 Moved by capillary fluid flow, these cells automatically 'fall' into the pyramid through a hole at the bottom. Soon after they settle in their 3D cage, cells begin to interact with cells in adjacent pyramids. Changes in the phenotype of the cell can now be studied in a better way than in the usual 2D situation. It is therefore a promising tool to be used in for example tissue regeneration research. The Dutch scientists expect to develop extensions tot this technology: the edges of the pyramid can be made hollow and function as fluid channels. Between the pyramids, it is also possible to create nanofluidic channels, for example used to feed the cells. How do they make those pyramids? How thick are the walls? This is so amazing. Like something right out of Star Trek. A prison to keep individual cells. Looks great to study cells this way in full 3D. Not moving around. Are they connecting with each other in that top picture those thin kind of wires? These cells don`t seem to pleased with this invention.